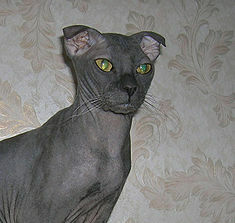 The Ukrainian Levkoy is a cat breed of an original appearance, hairless and with folded ears. These cats are of medium size, the body is rather long, muscular and slender of rectangular format. The bare skin of Levkoy is soft and hot, it is excessive, elastic and wrinkled. Levkoy cat's peculiar features are: special angular contour of its head and "stepped" profile (dogface appearance) folded ears and large, but not well wide opened, almond-shaped eyes. They are very friendly and active. The cats express sexual dimorphism.